Last year, RAD and Gayle’s son, Rob, traveled to Africa to visit a village sponsored by World Concern, an international non-profit organization that partners with the most impoverished countries in the world, teaching and working alongside villages to create viable, long-term progress. On his trip, Rob spent time in Maramara, a village in Eastern Chad that now has clean, sustainable water thanks to World Concern’s efforts. The partnership between Maramara and World Concern began over 5 years ago and has completely transformed the village. A photo Rob took on his trip of girls gathering water. 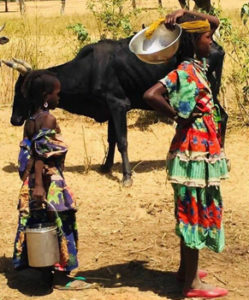 Due to the oppressively arid climate of Eastern Chad, women and children were once forced to walk for hours in the hot desert sun to dig a water hole, only to return home hours later with water that was contaminated with dirt and animal refuse. On average, women and girls in Africa & Asia walk roughly 3.7 miles, which takes 6 hours, to collect water. As one might imagine, the death and illness rates were sky-high and the overall quality of living was extremely low. 80% of illnesses are linked to poor water and sanitation conditions. The progress that Rob observed in Maramara was monumental. By partnering with World Concern to provide clean water to their people, the village now has fresh water that is pumped using a solar-powered well over 100 feet deep. There are two large water holding tanks about 10 feet off the ground to hold the water. The water is dispersed to four different water stations around the village using the natural force of gravity. Villagers simply have to turn a handle and clear, clean water flows out of a spigot. What was once an all-day event for women and children is now a simple task. But there’s more – water was the major catalyst in the village that led to other important changes. The work doesn’t stop with clean water. World Concern helps implement sustainable, long-term changes for villages. The villagers have been taught to make bricks and were able to construct a school building. World Concern helped them hire teachers. Children spend their time being educated instead of walking for water. The community has established a simple banking system and created a weekly marketplace to buy and sell goods to people from neighboring villages. They have been taught how to sustainably farm through the long, harsh dry season. In stark contrast, Rob also had the chance to visit a village about 20 kilometers from Maramara. This village is a reminder of what Maramara was not long ago. When Rob arrived, he saw children as young as 4 or 5 years old getting water from a hole in the dry riverbed about 5 kilometers away from the village. 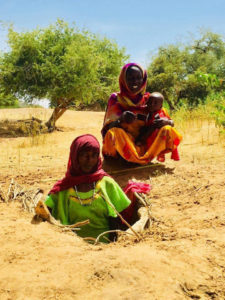 Some of the hand-dug wells were so deep that women and girls would have to use their entire body to climb down into the well and scoop from the shallow pool of murky, contaminated water. Those collecting water had to pour it into a plastic jug and then carry the jugs back to their homes in the sweltering 100+ degree heat. RAD and Gayle heard Rob’s stories and were determined to help in whatever way they could. After purchasing donations last year as holiday gifts for their friends and loved ones, this year they decided to make an even bigger impact. The heart of L-Tron is giving. RAD & Gayle decided to partner with World Concern to provide clean water, to educate and to gain continual donations in support of the clean water project. Last week, L-Tron held their Customer Appreciation and Ribbon Cutting event, which raised over $3000 to provide clean water. They are so thankful for their valued partners, customers, employees, and friends, who, together, will literally change lives halfway around the world. L-Tron will be continuing to partner with World Concern and gather donations through their #LTCweekofgiving and the holiday season. Instead of encouraging Black Friday sales, L-Tron is encouraging their customers and the community to make a donation to World Concern – and is giving 100% of magnetic mount purchases back to the organization. It was heartbreaking for Rob to say goodbye to the people in neighboring villages, knowing that they don’t yet have the help they need, and knowing that there are so many villages in similar situations across the globe. Mind-blowing statistics estimate over 2 billion people in the world are without access to clean water. Yet there’s a comfort knowing that organizations like World Concern exist and are ready to help as many villages as they can – they just need our support. 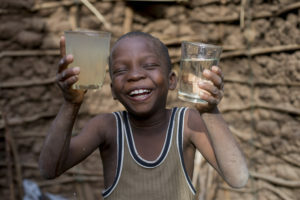 If you wish to support the Clean Water Project and to partner with World Concern to provide clean water, please visit https://www.l-tron.com/world-concern-clean-water/.